The British Pound turned out to be the best performing major currency on Wednesday, assisting the GBP/USD pair to decisively breakthrough the key 1.3000 psychological threshold and climb to its highest level since Nov. 8 amid growing market expectations of an extension of article 50 and receding risk of a no-deal Brexit. Ahead of next week’s vote on the UK PM Theresa May’s Brexit Plan B, a campaign to block no-deal Brexit gathers momentum on reports that the UK Labour Party will back an amendment, aimed at forcing a parliamentary vote on delaying Brexit if a deal isn't passed by Feb. 26. An extension of Article 50 was seen as increasing chances of parliament to push for a second referendum and continued providing a strong boost to the Sterling. The pair rallied nearly 140-pips intraday to test the very important 200-day SMA for the first time since mid-May 2018 and was further supported by some renewed US Dollar selling pressure. Against the backdrop of unresolved US-China trade dispute, concerns over the US government shutdown and a sharp drop in the US 10-year Treasury bond yield exerted some fresh downward pressure on the greenback and kept pushing the pair higher through the US trading session. The pair now seems to have entered a bullish consolidation phase and was seen oscillating in a narrow trading band, just south of the 1.3100 handle. There isn't any market-moving economic data due for release, either from the UK or the US, and hence, the incoming Brexit-related headlines might continue to influence sentiment surrounding the British Pound and infuse volatility around the GBP crosses. Looking at the technical picture, the overnight upsurge confirmed a near-term bullish breakthrough a four-month-old descending trend-line. 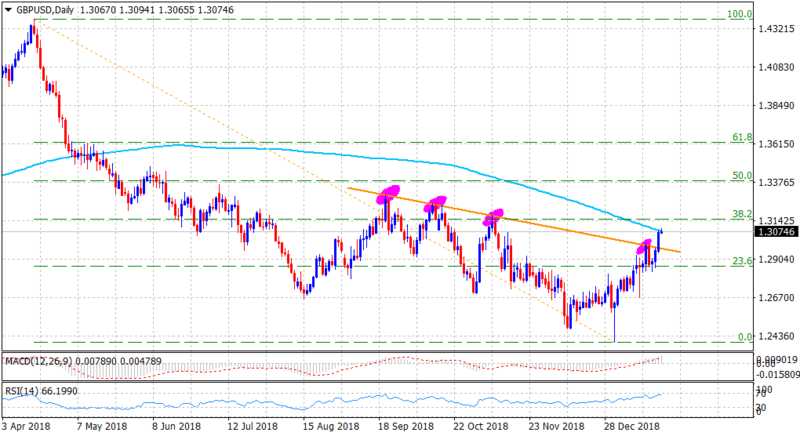 A sustained move beyond the 1.3075-80 region (200-DMA) will further reinforce the constructive outlook and lift the pair further beyond the 1.3100 handle, towards a resistance marked by 38.2% Fibonacci retracement level of the 1.4377-1.2396 downfall, around the 1.3145-50 zone. On the flip side, the 1.3030-25 region, closely followed by the 1.30 handle now seems to protect the immediate downside. Any subsequent slide might now be seen as a buying opportunity and hence, is likely to be limited by the descending trend-line resistance break-point, now turned support, currently near the 1.2960 area.